The notion that the Apollo Moon Landings might have been faked first came to my attention in the late 1990's and it startled me; I quickly became involved in Internet discussion groups about it (the good old forums of the pre-Facebook age!) and read Dark Moon by Mary Bennett and David Percy, see: http://www.aulis.com/image-viewer.htm?gallery/Fgallery2-1.jpg. As always I've striven to look at both sides of the story. I've debated this issue many times and read a lot of rebuttal material, and last night was part of my research because I went to my local Skeptics in the Pub to see Megan Whewell live, see: http://oxford.skepticsinthepub.org/Event.aspx/1995/The-Apollo-Moon-Landings-How-We-Know-They-Really-Happened. 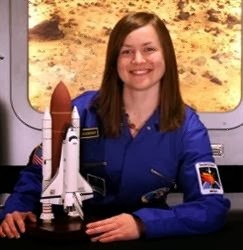 Megan Whewell is an astrophysicist, currently a postgraduate student at the University College of London, but her previous job was as part of the education team at the National Space Centre in Leicester. "I love space!" she said during her lecture and she did come across as very enthusiastic about astronautics, as most of those who challenge the moon landing hoax are. To her credit, she also disagrees with The Coxxer and thinks that the subject is still worth talking about, unlike what he rants about in this video: http://www.youtube.com/watch?v=1aXuQ9Dg2gE. (See here for more information on Prof. Brian Cox: http://hpanwo-voice.blogspot.co.uk/2013/09/prof-brian-cox-watch-this-space.html). I've missed the previous few Oxford SiTP's; the last one I went to was the one on Steiner Schools, see here from 15.05: https://www.youtube.com/watch?v=efpvWOfA17o. However I did attend the Greenwich one a few weeks ago, see: http://hpanwo-voice.blogspot.co.uk/2014/02/rob-brotherton-and-psychology-of.html. The venue has happily moved back from The Wig and Pen on George Street to The St Aldates Tavern with its much more comfortable and charming function room, and the bar there is always tended. At the start of her lecture Megan asked for a show of hands for who believes the moon landings were real, who thinks they're faked and who's undecided. I kept my hand down for all those questions because I was still in disguise... kind of... for the reasons I state in my report on the Greenwich event. She looked at me and said: "I notice not everybody raised their hands; that's fine, no pressure." She introduced her subject by stating from the outset that she was not there to persuade anybody who vehemently didn't agree. Her interest in the moon landing hoax theory came from a project she did at the Space Centre where she did meet "conspiracy theorists" like me and told them why she differs. She considers these talks a wholehearted success and, despite her professed lack of objective, she reckons she's achieved on average one conversion a day. The theory Megan Whewell addresses is that the Apollo Moon Landings of July 1969 to December 1972 did not take place, that NASA actually did not send any manned spacecraft to the moon at all and that the evidence that they did is fraudulent. The moon rocks are not real and the TV broadcasts were filmed in a studio on Earth etc. For somebody new to this information, it's a stunning allegation; it certainly was when I first heard it. The first person to propose it was Bill Kaysing who published a book in 1976 about it. Then, according to Megan, the whole issue became more or less dormant until 2001 when this TV documentary was aired on the Fox network, see: https://www.youtube.com/watch?v=Y5MVVtFYTSo, and it is the evidence contained therein that she bases her lecture on. One of the most well-known suspicious elements is that the flag appears to move by itself when nobody is touching it, as a flag would do on Earth when being blown by the breeze. However there is supposed to be no atmosphere on the moon and so why does the flag do this. According to Megan, it doesn't. 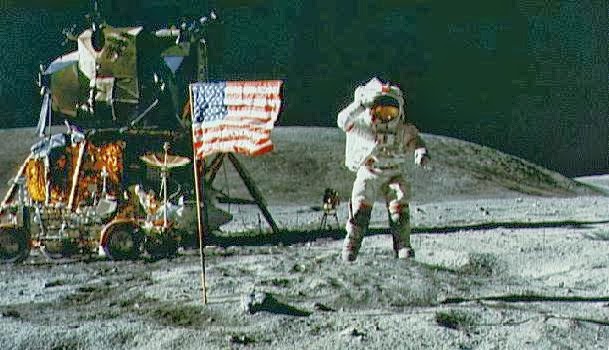 The flag moves because the astronauts are fiddling with it, and when they leave it alone it simply flaps from the residual motion of their actions, which is more pronounced because of the lack of aerodynamic drag. This is not entirely true, there are one or two suspicious pieces of footage, for example see here at 2.36: https://www.youtube.com/watch?v=ymwE1sNm82Y. Actually I'd be very surprised if the film makers who made this wouldn't think of that problem anyway, especially if that technical genius Stanley Kubrick was involved, as has been suggested. They would have been very careful to avoid any disturbances of the flag and the above link shows something that slipped through the editors net. One thing that many Apollo-believers thinks proves their case are the presence of the retro reflectors; these are a set of lenses said to have been placed on the moon by the Apollo astronauts which can be detected by shining a laser at them from the Earth. However, as Gerhard Wisnewski points out in his book One Small Step?, you don't necessarily need an artificial lens to get a laser reflection off the moon, see: http://www.amazon.com/One-Small-Step-Great-Dominate/dp/1905570120 (This book is originally written in German and was titled Lügen im Weltraum- "Lies in Space"). And what's more human hands are not necessary for placing equipment on the moon, it can be done by unmanned craft like the Jade Rabbit rover or Opportunity and the vehicles currently exploring Mars; this relates to the subject of the secret space programme which I'll come on to in more detail later. Megan then deals with the visual evidence, including questions about why there are no stars visible in the lunar sky on any of the Apollo photographs. She explains that this is because normal camera settings cannot capture stars; this is exactly the same when trying to photograph stars on Earth. You need a special astronomy camera with extra long exposure settings; there are also no stars in any of the photos taken from low Earth orbit on the International Space Station. For me this is not much of an argument for either side and I wonder why anybody originally brought it up. Megan then talked about the strange cases of shadows in the photos being in directions which indicate the presence of a local light source, when we're told that the only light available to the astronauts was from the sun. Some of these anomalies can be explained the way she does, that it was all to do with ground contours, but not all of them can. Just because tricks of perspective and an uneven surface means shadows can sometimes fall in different directions, doesn't mean that they can fall anywhere you like. She sites the MythBusters episode on the moon landing hoax several times during this segment of her lecture, see: https://www.youtube.com/watch?v=qz7cUP4o-ZQ. She uses their tests to explain the way the photographs do not contain silhouettes and appear correctly lit all round. As I've said elsewhere, it seems odd that the MythBusters team would attempt to debunk the idea that the moon photos were shot in a studio by recreating them... in a studio. Jay Windley made the same mistake, see: https://www.youtube.com/watch?v=AuUPYQIL2hY. In studio conditions it's easy to control elements that shouldn't be controlled in a fair test, like the more extreme contrast of sunlight. This is a problem anybody who's taken a photograph in bright sunlight knows all too well. On the moon there is no atmosphere to shade the surface from the sun's full glare and all the wavelengths that air and cloud filter out strike the scene directly. That's a neat segueway onto the subject of radiation. The Van Allen Belts are large zones of intense radioactive particles that surround the Earth. Megan claims that there was no danger from them and as it happens these belts are not particularly dangerous so long as you fly through them quickly, as the Apollo spacecraft did. However, the two Van Allen Belts were only discovered in 1959, just two years before President Kennedy made his announcement that NASA should put a man on the moon before 1970. When the Apollo rockets were designed and built, how much was really known about the possible hazards they posed. This issue was complicated further by Operation Starfish Prime in 1962 which detonated a nuclear bomb in space and created a third belt of radiation around the Earth. As Bennett and Percy point out, estimates on the dimensions and intensity of the Van Allen Belts vacillated considerably even into the 1990's. And because the Belts emerge out of the interaction of solar wind with the Earth's magnetic field, would they change over the course of the sun's sunspot cycle? These are questions that the NASA chiefs must have been deliberating. The prospect of a mistake was just too terrible to contemplate; brave American space pioneers dying from radiation poisoning, and all live on TV! And with the Soviets looking on of course, resting on the laurels of their previous victories in the Space Race. What's more once a spacecraft has left the shelter of the Earth's magnetosphere then comes the potentially even greater peril of solar flares and cosmic rays. Megan dismisses this by saying: "They just got lucky." Well, it's easy to say that after the astronauts have all come home safely. Another charge is that the motion pictures from the moon were also doctored; Megan sees this being done as impossible and sites this researcher's video as proof, see: https://www.youtube.com/watch?v=sGXTF6bs1IU. I'm not convinced that this couldn't be done if enough resources were involved. Megan also thinks that the moon rock brought back to Earth is another good reason to think that the Apollo moon landings were real. The idea that these rocks are actually normal rock from the Earth doesn't add up because by analyzing the crystals in them you can tell that they formed in the lower gravity of the moon. Some moon rock has found its way onto the Earth by natural means. It gets blasted off the moon by meteor impacts and then flies around in space for a while until some of it eventually falls onto the Earth. However only 46 kilograms of this rock has ever been found and it bears the telltale scars of impact with the Earth's atmosphere, a scorched and vitrified outer layer etc. I agree with her on this, the moon rock we see in museums is real moon rock, but was it picked up by the hands of Neil Armstrong et al? This again brings us into the realm of the secret space programme. Unlike some moon landing hoax theorists, I don't doubt that people have been to the moon. I'm virtually convinced that that we have; all I question is whether it was done at the time, and using the methods and personnel, that history tells us it was. If you consider the kind of free energy and antigravity technology that the governments are sitting on then it seems absurd that they wouldn't allow initiated individuals to use them to travel to the moon, see here for background: http://hpanwo-voice.blogspot.co.uk/2014/03/real-hoverboards.html. According to Megan Whewell, there has been multiple independent confirmation of the reality of the Apollo programme via subsequent space missions carried out not only by NASA but by other countries like India, the European Union, Japan and China. This is a long and complicated issue, but I wonder how independent those missions really were. As you know I think that national sovereignty has always been something of an illusion, and a conditional illusion at that. There is only one real government in this world, the Illuminati-controlled world government. This may go somewhere to answering a crucial question about the Apollo programme: If it was a hoax, why did the Russians collaborate with it? At the time, the Soviet Space Programme was the only other institution in the world capable of confirming or denying that the Apollo Moon Landings took place. If they smelt a rat they would have been all too eager to send their own craft up to the moon and see if the NASA landing sites were there or not. Also, only after the Cold War were the complete achievements of the Soviet intelligence agencies truly revealed and people gasped when they realized how successful the KGB had been in penetrating Western governments, intelligence, militaries and corporations, like with the Cambridge Spies, see: https://www.youtube.com/watch?v=gonvvQCnbOU. NASA was not immune to this scrutiny from behind the Iron Curtain and if they tired to fake the Moon Landings the Russians would have known about it long before the first rocket was even launched. This argument is all built upon the assumption that the Space Race was the same thing at the highest levels of authority as is was presented to the public as being. We were all told that the two global superpowers were locked in a bitter rivalry over who could do what in space first. Until Apollo the Russians had a decisive lead; they'd launched the first orbital rocket, Sputnik 1, and got the first man into space, Yuri Gagarin. Apollo was a chance for the USA to strike back. When the moon landings happened, America's pride was restored and the Russians were bitterly humiliated. The Soviets also had a manned lunar landing project in the advanced planning stages, called "LOK", but this was cancelled after the rocket blew up on the launch pad. Also the victory of the Americans in reaching the moon first apparently demoralized them so much that they just couldn't go on. This doesn't strike me as a very good reason to throw in the towel; and it doesn't fit in with the attitude of those involved in manned space flight at the time. Up till then they had always persevered in the face of hardship and hadn't let the other side getting there first put them off. The Americans suffered even worse setbacks, not only the Russians beating them into space, but the Apollo 1 disaster in which three astronauts were killed, but did they quit? It doesn't quite ring true to me. I think that the Space Race was far more than it appeared to be, it was a massive propaganda hammer that both sides used to excess; it was also only one part of a far more extensive conflict that was battled out down here on Earth. For both sides it was as much about information and disinformation as it was rockets, missiles and tanks. The war was fought against the people at home as much as it was those in the enemy's country. This was never more obvious than during the Vietnam War which was raging at the time; it was portrayed, wrongly, as the a just cause because it was Cold War in proxy: "fightin' them goddamn Communists wherever they raises they heads!" It is therefore not implausible that both sides saw it as beneficial for the Americans to be allowed to catch up... or be seen to catch up. It's possible that an analogy of the story of The Tortoise and the Hare was emerging for real; if the playing field hadn't been levelled, would the populace, on either side, have lost interest? Would they have begun asking why so much money was being channelled from domestic social programmes when there was so much poverty and hardship among their citizens? There was also the thorny problem of the massive grain import that had just been arranged between the USA and the Soviet Union. This deal may have prevented famine in Russia; it was very important to the Soviet regime that it remained in place. But could there have been another motive for their silence, one involving their own space programme? As Wisnewski points out, as do Bennett and Percy, there is major quandary related to the validity of some of the Soviet achievements too, like the flight of Yuri Gagarin on Vostok 1. Some similar discrepancies can be found in the visual record of that mission, as much as with Apollo, see: https://www.youtube.com/watch?v=3rgvSVdHr1Y; note the peculiar lighting effects inside the capsule for example. Why didn't the Americans shout that from the rooftops? Maybe it was for the same reason The Russians didn't about Apollo; both sides somehow agreed to turn a blind eye to each other's lies. What's that you see in the photo above? A Space Shuttle? Yes, but one without windows? 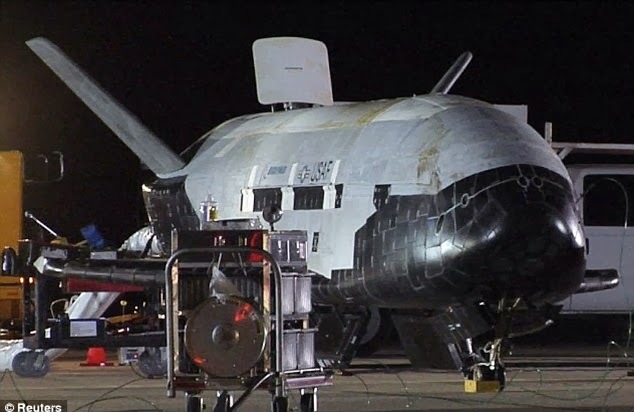 It is actually a Boeing X37, an unmanned spaceplane built for the US Government on the Black Budget. Its purpose is unknown and all operations related to it are highly classified, but I imagine its role is reconnaissance and intelligence gathering. It can orbit continuously for up to a year. This is just one minor part, the tip of the iceberg, of the secret space programme. The secret space programme is at least as old as the public one, and probably much older; there's evidence that Nazi Germany made some major inroads. At the deeper level it involves far more than just secret military Space Shuttles; it delves into the abyss of esoteric energy and propulsion systems that would make rockets totally obsolete. The defence journalist Nick Cook has done some good work into finding out the truth behind this dark and sinister subject with these two documentaries, see: https://www.youtube.com/watch?v=FEdTfL1G-yw and: http://www.youtube.com/watch?v=kD9RA1R3pOk. But even he only scratches the surface. At the same time evidence is emerging of artificial-looking structures on the moon and planets, see: http://hpanwo-voice.blogspot.co.uk/2014/01/mystery-object-spotted-on-moon.html. These could be artefacts of an extraterrestrial civilization, past or present, but what if some of them come from down here? There is testimony emerging from some very credible people who have been involved in secret research into energy and propulsion systems not recognized by mainstream science nor published for the general population to examine and use, for example see: http://globalbem.com/. Why would this happen when these discoveries could do so much good, relieve us from the need for fossil fuels, eliminate poverty, end environmental destruction etc? The reasons why this technology is suppressed and we are not all flying round our towns in antigravity aircraft is a big subject, but I tackle it in detail here: http://hpanwo-tv.blogspot.co.uk/2013/05/ben-emlyn-jones-live-at-truth-juice-hull.html. It is clear that if this technology exists then it will be used by those initiated to use it; and this throws the whole concept of space exploration into an entirely new light. It is impossible to consider the validity of the Apollo Moon Landings without taking this into account. As I said, I don't doubt that people have been to the moon; I'm sure that they were going there long before the first American and Russian rockets even lifted off. There are bases on the moon, some manmade and some extraterrestrial; maybe a few of them are a combined effort. In fact why would they stop at the moon? Have the Illuminati even visited other planets without telling us? Maybe they've even gone beyond our solar system to other stars. It's even possible that the secret studio where the moon landing images were filmed really is on the moon, at one of the bases there. Or it might be on Mercury or a similar airless heavenly body. If so then don't you think we, the people, have a right to know? More detailed background on the subject of this article. See here for a report on Marcus Allen's debate at the British Interplanetary Society: http://hpanwo-voice.blogspot.co.uk/2012/07/marcus-allen-at-bis-update.html. See here for a previous article I wrote about the Moon Landings: http://hpanwo.blogspot.co.uk/2009/01/i-went-to-godamn-moon.html. There were a few questions during the question and answer session after Megan Whewell had finished her speech. These mostly related to the psychology of "conspiracy theorists" which Megan did not respond to, saying that it was not her field of study; really she and Rob Brotherton should make a double-act. She doesn't think that the achievements of China or other nations in space will either reinforce or diffuse disbelief over the moon landings. At the end Megan put up links on her display screen to various anti-hoax websites like Clavius, see: http://www.clavius.org/. This website includes a discussion forum, but I would advise HPANWO-readers not to join it; I did myself once and I regret it. I was not allowed the chance to engage in a civil debate and was subjected to extreme rudeness and hostility. I'm glad I went along to this Skeptics in the Pub and thanks to Megan and all the organizers for setting it up. However, her repertoire didn't contain many points that I haven't heard before; I feel that she has fashioned her delivery for somebody new to the subject. As I've said elsewhere before, the Skeptic Movement itself is an ideology and is not directly related to science and reason, see: http://hpanwo-radio.blogspot.co.uk/2012/07/programme-5-podcast-skeptics.html. I wonder, despite their constant appeal for "evidence! ", whether they are being objective about themselves. Latest HPANWO Voice articles: http://hpanwo-voice.blogspot.co.uk/2014/03/real-hoverboards.html. Latest HPANWO TV films: http://hpanwo-tv.blogspot.co.uk/2014/02/notts-roswell-2.html. Latest HPANWO Radio shows: http://hpanwo-radio.blogspot.co.uk/2014/03/programme-79-podcast-trystan-swale.html.